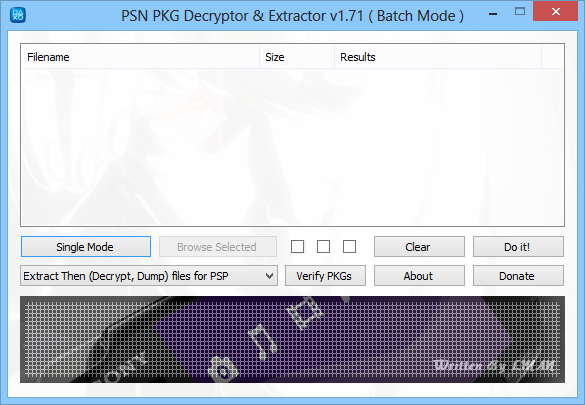 As it's name suggests, PSN PKG Decryptor & Extractor is designed (Specially for the PSP) to help you decrypt PS3 & PSP PKG file and extract the files from it. For PS3 It can extract PKG files only, For PSP It can extract and (decrypt, dump, verify the dumped ISO, generate KEYS.BIN from PSOne EBOOT.PBP file) and prepare the extracted files to be ready for use ONLY on the PSP system. Extract All PS3 & PSP PKG files. Generate KEYS.BIN for PSOne Game from PSOne EBOOT.PBP file. Prepare the files for the PSP System. Detect the Corrupted PKG files. Check & Verify the Dumped ISO. View ICON & PIC and Title Name, Title ID, Category, Parental level of PKG file after extracted. Check On-line for Games Updates for PS3 & PSP Games. PKG file to decrypt and extract it's content. PSP ISO file to verify it. EBOOT.PBP to Dump it to ISO format. PSOne EBOOT.PBP to Generate KEYS.BIN file from it. EDAT/PGD file to decrypt it. PTF file to decrypt it. Select "Auto Detect PKG Contents" to automatically (decrypt, dump) it's contect. Select "DLC & ADDON" if the PKG file is a DLC\ADDON. Select "Game & Mini Game" if the PKG file is a Game\Minis. Select "PSOne Classic Game" if the PKG file is a PSOne Classic Game. Select "PC Engine Game" if the PKG file is a PC Engine Game. Select "Update" if the PKG file is a Game Update. Select "Theme" if the PKG file is a Theme. 3) See the log dialog for any details. PKG files to decrypt and extract it's content. PSP ISO files to verify it. EBOOT.PBP files to Dump it to ISO format. PSOne EBOOT.PBP files to Generate KEYS.BIN file from it. EDAT/PGD files to decrypt it. 2) Press 'Do it' to start the Operation. 3) Double Click on each file to See the log dialog for any details. Put "psone.keys" in the same folder as the program, so you can export the needed keys.bin for your PSOne game. Drag & Drop files into 'PSNPKGDecryptor&Extractor.exe' icon to activate the Batch Mode. Press F1 on Single\Batch form to show the Config dialog. This program intend to be use only with your own legal copy of the game. +You can Export KEYS.BIN from "PSOne.keys" file. 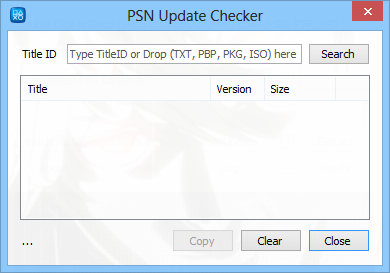 +Automatically Detect if the PKG contents is for PS3 System Only to disable any PSP functions. +Automatically Generate KEYS.BIN from PSOne EBOOT.PBP file in same path as the EBOOT.PBP file. +Automatically Generate KEYS.BIN when extracting PSOne game from PKG file without needing for PSOne.keys database. +Automatically Sort KEYS by game region & title and save it to PSOne.keys database file when adding new KEYS.BIN to PSOne.Keys file. +Detect if the KEYS.BIN is already exists in PSOne.keys file before adding it. +You can Add new KEYS.BIN to PSOne.keys database file without needing PSOne.Keys Generator. 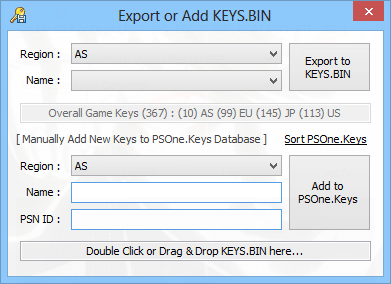 +You can Sort KEYS.BIN by game region & title and save it to PSOne.keys database file. +Show Warning and Abort the Operation when the PKG file path is too long. !Fixed reading Large PSOne EBOOT.PBP file. +Automatically Decrypt DLC files, Dump EBOOT files to ISO format when Drag & Drop it. +Show Warning and Abort the Operation when there is no free space available before extracting PKG file. +Check & Prepare the EDAT/PGD file for the decryption process if failed, which Fix a bug with pgdecrypt that cannot decrypt some EDAT/PGD files. +Support decryption of PTF Themes. +Display ICON & PIC for PBOOT.PBP UPDATE file. +Auto decryption of PGD/EDAT files after extracting PKG UPDATE file. +Improved Detecting PKG file for UPDATE file and also EBOOT.PBP file for non PSOne Games. This will create a Folder named "PKGDir" then will copy the PKG file to it, and after the operation is complete the copied PKG file will be deleted. +New CheckBox Option in PSP Device dialog that can detect Connected PSP By Device Model. +New CheckBox Option in Log dialog that can view texts by Word wrap. +New Command-lines to export files (-export npdpc.exe) (-export pgdecrypt.exe) (-export pkgview.exe) (-export allfiles) to the same path as the program. +New Readme Button in About dialog that display informations and changelogs about the program. +Support to automatically get information and download link for PKG file from .XPD file. +Display Theme Title after decrypting it in the log details. +Improved log dialog details and automatically detect the PKG download link. !Read readme_linux.txt for more informations on how to get it work under Linux System. +New Display a Confirmation message to rename the PKG file to it's ContentID if the file name is above 55 Characters. !Correct 'Set Working Dir' Path when switch between Single and Batch Mode. !Another Fix for the new decryption method. !Fixed a problem in Batch Mode. +Added New ContextMenu Option "Copy Selected Link(s)" And "Show Details" in PSN Update dialog. +Support to Display SHA1-Hash, QA-Digest and also PKG Type in log details. +Automatically Abort the operation if the PKG file is corrupted. +Support to Verify UMDVIDEO ISO file. +Detect Unofficial PSOne EBOOT.PBP file. !Fixed an issue while generating KEYS.BIN for some PSOne Game. !Fixed a problem when switch back to SingleMode. +Improved detection of pgd\edat files. +Reduced the memory usage for pgd\edat files. !Fixed "PKG file is Incomplete!" message when process\verify PKG file that >2GB in size. !Fixed an issue while decrypting some PSP PKG Game Update. +Updated bad dump fixes to support ULJM05340. +Added a New Button to display the Configuration window. +Improved Performance in batch mode. +Improved and Changed the Log window style, and added new label to Copy the selected log to Clipboard. +Added Configuration Button to Batch Mode. +Added a New CheckBox Option in Configuration window to Permanently Delete PKG files after decrypting it. +Added a New CheckBox Option for Ask to rename PKG files to It's ContentID. !Fixed ask to rename PKG option, doesn't work when each time launching the program. +Support to Drag and Drop PKG's URL into the Input field. +Auto Fetch PKG's infos from PSN URL. +Added New Button to Add files, and Removed the Double-Click add function. +Added New Option to Use and add a download location for PKG files. +Support to download PKG files from any URL. +Support to Display Absolute URL Path in the log. +Fixed an issue when pasting\adding file's path into the input field. 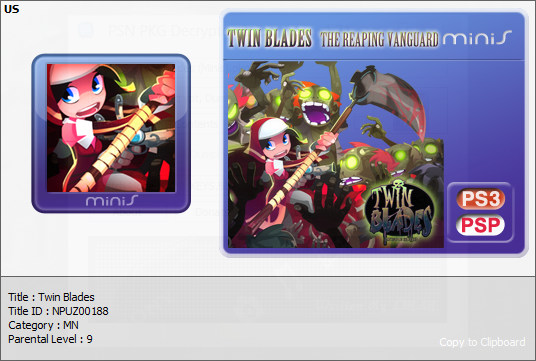 !Fixed decrypting PSP\PSOne PKGs >2GB. tpu for PGDECrypt & NPDecryptor.